See I have been doing some artwork whilst here and I am quite pleased with the result. All of the above works are to be donated to the Seto City Ceramic Art Museum. Today was also a bit of a sad day as I had to say goodbye to some wonderful new friends. We have already added each other's skype address to our contacts and we promise to keep in touch. I will really miss them all. Anyway I leave here tomorrow and head to Nagoya airport, but I would very much love to return to Seto one day. Here is a picture of me with all the trainees, my assistants, and Marika from the arts centre. I am going to miss them so much. So that is the last blog from Japan, stay tuned for my next adventure which will to India. Well I have seen many sights and had some wonderful experience since I last spoke to you. Again I had been invited out to dinner to an artist's house who paints in a traditional Japanese style using powdered pigments. His home was beautiful, the meal was amazing and he even painted for us whilst we watched. It was an very special experience, topped off by him giving me the painting he had just finished, as a gift. Here are some images of the evening. He even managed to continue to paint with his 2 year old daughter jumping all over him. Yesterday, being Tuesday, the studio was closed and I was taken on a trip to see Kyoto. It is a very big town, with a mix of the very old and the new. We visited a number of temples and a Zen garden that are all world heritage listed, and also managed to squeeze in some eating and shopping. It was a fantastic day and I would love to return with more time to explore the city. Here are a collection of images from the day. We saw so much that I can't possibly show it all, but the photos show just what a beautiful and special place Kyoto is. As for today, well it was spent finishing my work. Adding lights and the final touches. I also unpacked the kiln with the students work in it and added lights. I also had a chance to spend a little bit of time in the glass studio, trying some glass blowing and making my own glass. It is something I have not done for many, many years and it was great fun to try again. Thanks to the trainees of the glass studio for their help and patience. One trainee is also helping me, by making one glass rod that I am hopefully going to incorporate into my last sculpture. Tonight was my farewell party and it was a bit sad. I have made so many new friends and I will miss them all so much. I look forward to staying in touch with them in the future. Seto city has been the most wonderful host and I feel a real connection with the place. I just know that one day I will return. Tomorrow is my last full day in Japan and I will spend it taking photographs of my work. I have no space to bring anything home, so really want to record what I have done here with some decent photos. I will donate 3 sculptures and give the others away as gifts to those who have made my time here really special. I will post some photos of my finished artworks on my final blog from Japan....tomorrow. Ok..ok, its seems like I have forgotten about writing this blog, well you are wrong as there has been some kind of problem and I have not been able to post them. So here is what has been happening over the last few days and hopefully it gets to you. Obviously my work has been drying and yesterday was the final firing, which will be unpacked tomorrow. As there are no more firings scheduled, then I am unable to make any new work. But I have still been keeping busy. Kuwa took me to see a wonderful small exhibition of ceramic sake cups with many important ceramic artists of the area showing their work. I fell in love with one by an artist I have admired and even researched as part of my Masters Degree. His name is Shigekazu Nagae. In fact we had been invited to his house for dinner that night. Kuwa told me that he has a gallery at his studio and I hoped that there might be something that I could afford to buy. In short,his work is amazing. 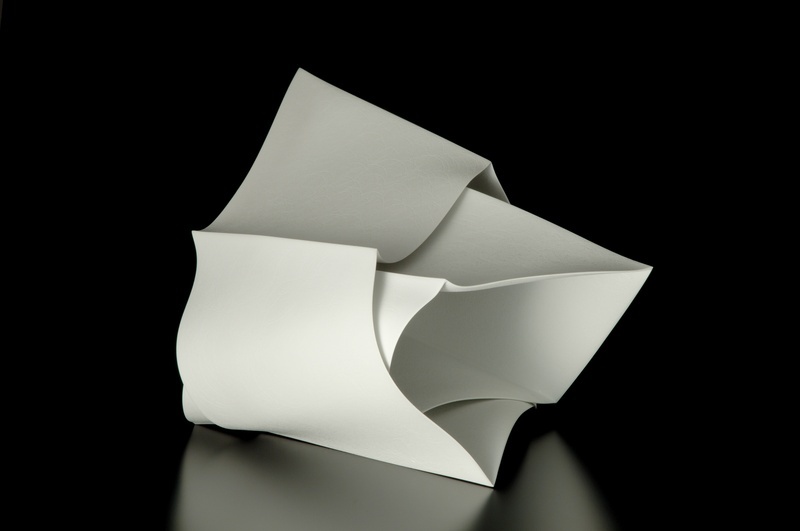 Sculptural porcelain forms that are allowed to warp and drape in the kiln to create organic shapes that create a wonderful silhouette. They seem to defy gravity, and all 24 works sold at his exhibition at Saatchi Gallery in London. It was a wonderful evening, with a long table set up through the middle of his studio. An amazing array of seafood all cooked at the table in large ceramic bowl, with each addition adding to the delicious stock. He had even arranged for some Australian wine and Estonian vodka. His cousin is a folk singer and played a number of his songs about ceramics in Seto. We went upstairs to his gallery and I was breath taken by the beauty of the large sculptural works. If only I could bring one home. I agreed to buy a much smaller piece and am very excited to own one of his works. Yesterday, Mare and I both held workshops. I had 8 students who had paid to attend for a couple of hours. Due to time constraints they could only make a small sculpture each, but they all enjoyed it and produced some good artwork, considering they had no experience in using clay. In fact I have been invited to dinner by one of the participants. As it turns out, her husband is a well known traditional Japanese painter and he contacted the arts centre and organised dinner. So I am looking forward to that tomorrow night. Tonight, however, it is dinner with the trainees. I'm not sure where we are off to, but I enjoy their company very much, so it should be fun. Apparently we are eating a Japanese dish that I have not yet tried. It a mystery to me, but I will keep you informed. Wednesday is a farewell party, Thursday will be some last minute shopping and packing and can you believe I fly home on Friday. So not much time left, just enough to unpack the kiln, fit the lights and take some photos of my work. I must say I am ready to come home to family and summer and apparently a new dog at our house. Anyway talk to you all soon. Well this morning I woke to a very white landscape, and snow falling quite heavily. It was amazing for me to see as (as I mentioned in an earlier entry) I haven't really seen snow falling. As for my artwork, well it is at the drying stage now, in readiness for the firing which is scheduled for Sunday. Tomorrow I am preparing clay for the workshop that I am running for eight people. Each will make a small sculpture which will be lit from within with an LED light. The workshop is on Saturday and is the last of my official commitments to the Seto Cultural Promotion Foundation. On completion of the residency I will donate 3 artworks which will be exhibited at the Seto Arts Centre in May at an artists in residence exhibition. After that they will become part of the International Artists collection.Four artists are invited each year, however this year there were only 3, myself, Mare from Estonia and another ceramic artist from Canada. It is a fabulous experience funded fully by the Japanese government, so if there are any glass or ceramic artists out there who are interested, then please send me an email and I can elaborate on the process of applying. I know I keep repeating myself, but yet again I really have been very busy. Monday was spent working in the studio and I am nearly finished thankfully. Mae, one of the trainees had been away for a few days for a friend's wedding and he bought back some new foods to try. It's quite interesting that each prefecture seems to have its own unique foods that are only available there. You just can't buy it anywhere else in Japan. So I tried a slice of lotus with all the little holes filled with mustard. Oh my gosh, I think I nearly exploded, it was the hottest thing I have ever eaten. I think my nostrils are still recovering. I moved away from the table after that, just so I was not offered anymore. It is considered quite rude to refuse an offer of food. Later I was offered and yes did try something that many of you guys will not be happy with. I can hardly say it, but I tasted a small piece of horse. It seemed that it was quite a normal meat to the trainees. It tasted a bit like beef actually. Anyway I have always tasted something strange on every trip I have been on and I think that horse was easier to eat than all the bugs I ate in China. Later that evening I was glad to hear that we were ordering McDonalds for dinner in the studio. It tasted just the same, except for a Japanese style hamburger that had much more interesting flavours of teriyaki and ginger. Yum, they should bring that one to Australia. Tuesday was a rest day and Kuwa and Ai had organised a shopping trip. Actually we didn't do much shopping but we saw some amazing things. Kuwa took us to Shizuoka, in the next prefecture. She was born in this area and her mother still lives here, she is 87. We went and visited her. I expected a frail old lady, but no she looks young and lived on the 6th floor of an apartment building. She was quite amazing. She made us some green tea, which the area is famous for and then informed us we couldn't stay too long as she has to catch a bus to a friend's house for lunch. Did I say she was 87....amazing. Anyway check out the view from her apartment. Yep it's Mt Fuji. She said we were lucky to see it as it is often covered in clouds. If fact we saw it so many, many times that day as it stands above the landscape, it seems to be everywhere you look. After this Kuwa took us to see a shrine, which required a cable car ride to get too. Fun! This shrine was the first tomb of a famous shogun and was an amazing place of wonderful colour and a great many stairs. But that was not the end of the day. Lunch was at the one of the hundreds of strawberry farms that line the coast. And we were going to pick our own, which is not strange to us. But when I was handed a small container with a small amount of condensed milk I was confused. Anyway we were placed in our own little hot house and were given half an hour to eat as many strawberries as we could manage. Now that's a bit different. Let me tell you, they were the most delicious, sweetest and tender strawberries I have ever eaten. We all made ourselves feel quite ill, but it was wonderful. I shall remember the taste of those strawberries forever I think. But wait there is more. From here we went to a historic site called Toro, which was discovered in 1943. The site has been redeveloped back to its original state. The area includes a number of dwellings, some rice storehouses, a ceremonial hall and rice fields from a farming village from 1900 years ago. And yep I learnt how to make fire like they did in the Yayoi period. From here we found some shops and some dinner at a restaurant that served Aussie beef, served on sizzling plates. The image below is showing a paper placemat that is used to protect you from the hot fat (funny). It was quite nice to have meat and 3 veg after so much Japanese food....and with a knife and fork. A two hour drive home and the day was at an end. What a great experience. It's back to the studio tomorrow. Wow is this 2 blogs in 2 days, I am on a roll hey? As I mentioned previously today we visited a very well-known gallery about a 20 minute drive from Seto city. It is run by a husband and wife team. He is a ceramic artist and she is a glass artist. It was a beautiful setting in a 200 year old building with beautiful gardens. It was the opening weekend for an exhibition of artwork by artists from the areas affected by the earthquake last year. There were many people, as confirmed by the many, many pairs of shoes just inside the door. This time it was easy remember that I had to remove my shoes. Below is an image of the understated beauty of the gallery entrance. I was particularly taken by the little row of red fruit at the door. Inside was a range of ceramics, metal and textile art displayed with the same beautiful simplicity. I felt an overwhelming urge to buy something and support these artists, and so a beautiful black bowl caught my eye. I am looking forward to using it when I go home. We had lunch at the gallery and as usual it was presented in such a way that I was compelled to take a photo. It was a simple meal of vegetable soup, a marinated carrot salad and salt bread (tasted a bit like date loaf). And I just had to include the floating head dog sculpture which is actually attached to the table. Isn't it great? After all of that fun it was back to the studio and I have been trying out what the LED lights will look like in my little frilly sculpture. I am happy with the result and I am really looking forward to seeing a large collection of 20 of these all lit at once. But I have to wait until after the final firing which is in about a 5 days. Anyway that is all from me tonight, will speak to you all soon. Hi there everyone, well today was my open studio. So the morning was spent setting up. I expected that I that it was simply that the studio allowed people in to see what I was up to. However it was much more formal than that. A table was set up with a display of my work freshly out of the kiln. Another table was set up for me to work and chairs were arranged for people to sit and watch. I had an interpreter and I demonstrated how I created some of my work whilst the interpreter sat beside me and relayed everything in Japanese. I had a portable microphone and it was quite strange to hear myself broadcast around the studio. About 40 people visited and they all seemed interested in what I was doing, and I had lots of questions asked. So it was a success. After my presentation they crowd moved upstairs to see Mare talk about her glass work, which was very interesting. She makes very delicate work which is kiln fused using glass powders. After was spent talking and laughing with my assistants and some of the trainees. And if you look closely, yes it's a packet of Tim Tams. A gift from the interpreter. After a discussion about shopping, my assistants at the front left and right of the above picture, offered to take me shopping. Shopping......of course! We went to a funny little shop full of strange gifts and gadgets. It was a great place to get some gifts to bring home to Australia. Next was off to a fashion clothing shop, aimed at teenagers. I picked up a great down jacket at a super cheap price. Apparently it's a good time to buy jackets as they are all on special. Yay I love a good sale! Apart from all of that fun, I did unpack the kiln this morning and now you can really see how interesting the black clay is. See the picture below. And just to show how many people choose to ride bikes around here, I thought I would upload this photo of the bike parking at the local train station. I could not help but take this photo as I was so amazed. Tomorow I am off to visit a gallery and then out for coffee with Mare and the glass artists. So that should be fun. Then back to work in the studio for the afternoon. So I'll talk to you all soon. Well it's been a couple of busy days since I last spoke to you all. Still very busy. Tomorrow is a day off, and thankfully I have nothing planned, so I might explore Seto city a bit more. Yesterday was more working in the studio. I did however get taken out to lunch with 3 of the trainees. It was a wonderful restaurant. Did I tell you how much I am enjoying the food...oh yeah; I might have mentioned that once or twice. Anyway the meal below was what I ordered all for $12 Australian dollars. I love the presentation and the use of ceramic plates. All these plates, bowls and dishes are all hand made by local ceramic artists, and just make the experience of eating that much more pleasurable. After lunch Kuwa had a friend who was hosting what seemed to be historical games. The reason why was lost in translation, so I am not sure what it was in aid of. Any way it cost 300 yen to play and involved participants to be dressed in kimonos. We played a game much the same as 'memory', a matching game made of ceramic shells lined with images of ancient Japanese scenes. Then was a game that was played over 600 years ago. This involved 5 ceramic cups filled with hot coals. On the hot coal was balanced a small square of glass. Our host delicately placed small pellets of incence on the glass using chopsticks. Each cup was then passed around the group in a manner very similar to the tea ceremony. So I had to take the cup, place it on the palm of my hand, turn the cup twice to the right and covering my nose and the top of the cup, smell the fragrance and then turn the cup twice back to the left and pass it along. Using a calligraphy pen and some beautiful paper I was required to record which two were the same fragrance. At the end the answer was revealed and I got it completly wrong, but so did everyone. It was very interesting. See the photo below. The one above is going to stand on the studded side and is about 45cm in height. Below is some detail. The little frilly ones above are part of an installation. There will be 20-30 (depending on time) and are made of fine porcelain which will be lit from within using LED lights. They are very delicate and are sitting of temporary stands to protect them whilst drying and when they are in the kiln. I have made 10 so far. Tonight was my turn to cook for the trainee's. I resorted to cooking what I knew well and what could be cooked with only one portable burner. So seafood risotto it was. I managed to find all the ingredients in what seemed like an eternity in the supermarket. Fresh seafood is quite amazing and as I was studying the selection, I realised some of it was still quite alive. Poor little things all packaged up in the fridge at the supermarket. Anyway I decided the prawns with no heads were my safest and most dead option. I also included some fresh crab, and mussels. It was a success, thankfully. I served a cheese platter after the meal and that was the most interesting to the Japanese. They had never tried any of the cheeses I had. So now they have tasted Brie, Blue Vein and Tasty cheese. How funny. Not much to report today, as I am still in the middle of a new sculpture and keep forgetting to take some new photos....sorry. But I did get my hand painted blue and white chopstick holder back today. I am pretty happy with it. I might have to attempt this again when I am at home. Not bad for a first attempt. It really is quite a technical process, requiring you to hold the brush correctly and allow the colour to pool to ensure the variation. I most certainly do now have more of an appreciation for this technique, and those who are masters in this art form. Anyway I promise to take some more photos of my own artwork tomorrow. Firstly let me say I have received all of your messages, so thanks as I love hearing from you all. Well the last two days have been busy again. I spent all day in the studio yesterday and have started a new sculpture. No photos yet as it is all in pieces at the moment. I am also having a little play with the black clay which I am enjoying. The first firing went well and all the little curly bits survived the firing, as did everything else. Thank goodness!! So its full steam ahead to make sure I get a full kiln load for the next firing. Last night we had welcome party number 5. This was held at the Seto Cultural Centre and was basically a staff party, with all the trainees and the resident artists. It was a wonderful evening, with a range of Japanese food, some I hope I never have to eat again, fermented soya beans for example. All of the other food was amazing, even the raw tuna. Today was a lecture at the local high school. This is a school dedicated to ceramics which is quite unusual to us in Australia. I presented a lecture on my own art and some other Australian ceramic artists and then some information and pictures about school life in Australia. This was followed by a tour of the school, which is an amazing complex with art facilities exceeding what I experienced at university. Mare presented a lecture on the history of glass art in Estonia. We returned to the studio to work a little more. I was presented with a gift from Kuwa. She showed me a collection of her tea cups and asked me to choose one to remember her. Below is a photo of her in the studio and she has been a wonderful friend to me whilst I have been here. Her work (above is the tea cup she gave me) is quite beautiful, and very organic. I will treasure it. All ceramic artists seem to have a range of tea cups, regardless of what kind of work they do. Ceramics is very well regarded in Japan. Kuwa usually creates organic sculptural forms that are wall mounted. Anyway it time for me to get some sleep, and I have another big day in the studio tommorow. Kuwa, Ai, Mare and I have a shopping trip planned after the next firing, so I need to get moving to have it all finished. I am looking forward to shopping. Yay! !